IPOB Leader, Nnamdi Kanu, has vowed to petition US President Donald Trump over the role his ambassador to Nigeria, Stuart Symington, played in sending an impostor to the White House as “dead” President Muhammadu Buhari. 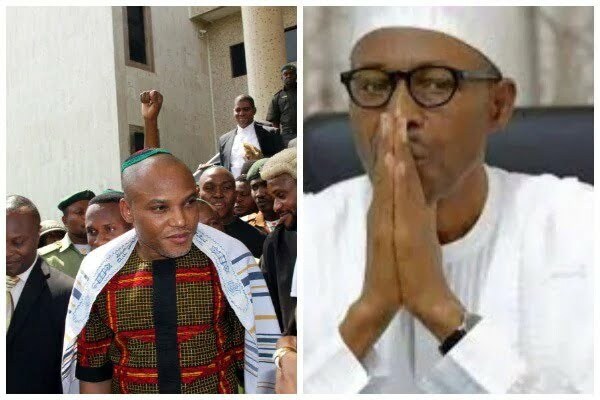 The IPOB leader further said the motive behind the petition was to prove the seriousness of his caveat that an impostor is superintending the affairs of Nigeria and holding international engagements on behalf of President Buhari. “US President Donald Trump never met with President Muhammadu Buhari. “The claim I shall be making official tomorrow (Sunday) to the US Ambassador to Nigeria is this: ‘That you are complicit in the sending of an impostor to President Trump. The man you sent to Trump is Jubril Aminu from Sudan and not the “dead” President Muhammadu Buhari.